Our range of products include mens sherwani, jodhpuri suits, kurta pyjama, designer suits, embroidered jodhpuri suit and indian sherwani. 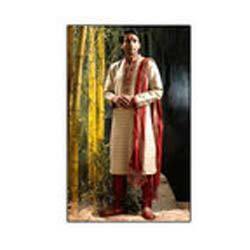 With innovative approach, we offer Mens Sherwani that amplifies the personality of the wearer. Intricately designed and stitched, our range of sherwanies are stitched for perfect fit. Available in attractive patterns, prints and quality fabric, the array of collection depicts traditional and current fashion statement. Strictly checked on points of printing, embroidery, shrinkage and color fastness, our range is customized on the requirements of the client. We offer Jodhpuri Suits that showcases the contemporary trends, fine hand work and legacy of ethnic Indian craft. Elegantly embroidered with sequin and bead work accompanied with beautiful color contrast, our range is ready to cast charisma on others. 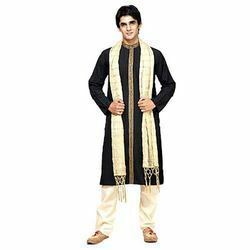 Superb mixture of Indian and western taste, it imparts royal look to the wearer. Color fastness, printing and shrinkage are strictly checked before final approval. We also offer tailor made solutions as required by the client. 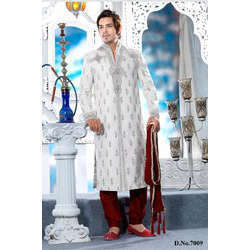 We offer Kurta Pyjama, which serves as perfect wear for summer season. Designed to complement different personalities, our range posses unique designs and patterns with fine texture. Appreciated for fine cuts, top class finish and exotic designs, these are comfortable and perfect to wear on various occasions. Available in different sizes and color combinations, our range is moderately to intricately embellished with embroidery and decorative metal, wood or plastic buttons, tasseled ties, cloth balls and loops. We check colour fastness, shrinkage and printing of our range before clearing to dispatch. Customization is also provided as required by the client. 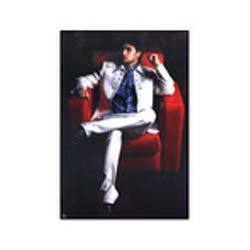 Our collection of Designer Suits are synonymous with some elegant words like excellence and legacy. Styled with utmost perfection our suits are in line with latest fashion and the buttons provide it a more fashionable look. Made to comply with high standard taste, this suit is available in classic as well as contemporary styles. Elegantly design and stitched to impart an impressive look to the fashion conscious person, these are available in various cuts and finishes. We can customize our range as specified by the client. 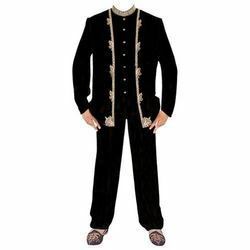 Our range of Embroidered Jodhpuri Suit are designed to cast a charisma on others. These are very graceful and elegantly embroidered and are available in beautiful colour contrasts and elaborate sequin and bead work. The borders are intricately designed to offer an attractive look to entire jodhpuri suit. 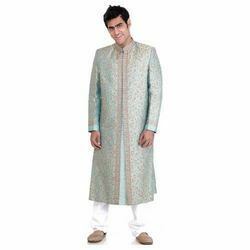 We design and offer a wide range of elegantly designed and stitched for the perfect fit Indian Sherwani. Our array of sherwanis depicts current fashion and traditional style and is available in attractive patterns, prints and superior quality fabrics. These fabulously designed sherwanis are perfect party wear and ideal to wear on festive occasions and weddings. We design and stitch a wide range of Wedding Suits that are available in contemporary designs and comply with latest fashion trends. 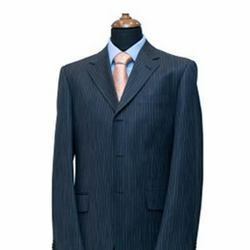 Our range of wedding suits is available in a plethora of designs and cuts. These can be customized as per the varied requirement in terms of color, design and fabric used. 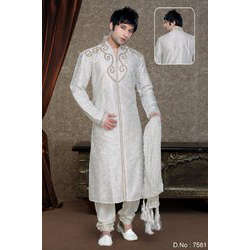 We are one of the leading manufacturer, supplier, and exporter of wide range of a Groom Sherwani. All Over machine (Thread Work) On Front Border, Collar, And Cuffs With Touch Up Of Hand Work Like Cutdana ,Stones, Tikki and patch Work Gives A Charming Effect. These All Collections is Made To Measure Size 36 To 44 and Extra charges would be applicable for Sherwanis above 44 inches If matching stole or mojris are desired with the outfit, then additional charges would be applicable. Rate For Matching Mojri (Shoes) Rs.800/- and Matching Pagri (Turbans) Rs.1100/- & matching Dupatta (Stole) Rs.600/- it will take 25 Days to Deliver. All other Accessories are for Photography purpose and There might be slight color variation due to lightings & flash while photo shoot. The bright shade seen is the best closer view of fabric's color.